Bolivia's President Evo Morales, wearing garland made from coca leaves, holds up the folder containing the newly-signed coca law at the presidential palace in La Paz, Bolivia, March 8, 2017. Bolivia's leftist president Evo Morales signed a law Wednesday nearly doubling the amount of land for legally growing coca — the chief ingredient in cocaine. “We want to guarantee coca supplies for life,” he said in a long speech despite a raw and ailing throat from swollen vocal cords. The bill raises the limit of coca crops farmers can plant from 12,000 hectares to 22,000 hectares. Morales is a former indigenous coca farmer who still leads a coalition of coca farmers unions in Bolivia's Chapare region. While coca can be used to produce cocaine, it's traditionally chewed throughout the Andes mountain regions as a mild stimulant to fend off hunger and to ease pain, thirst and tiredness. When brewed as a tea, coca can prevent air sickness. 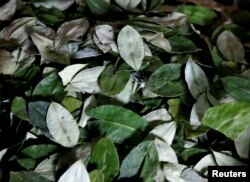 Coca leaves of Yungas region are pictured at the Coca Growers Association market in La Paz, Bolivia, March 7, 2017. Morales expelled U.S. Drug Enforcement agents from Bolivia in 2008, accusing them of spying on him and helping the opposition. Opposition lawmakers are decrying the new coca law, saying it will increase cocaine production and attract hordes of drug traffickers. Some coca farmers' unions also oppose the law. They say the crop grown in the Morales'-backed Chapare is not as good as that grown in what they call the “traditional regions,” and would primarily be used in cocaine.